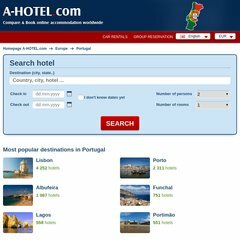 Topics: World, Europe, Proceed To Content, Portugal Accommodation, Portugal Guide, and Accommodation In World. tavira.a-portugal.com A - PORTUGAL.com - Tavira Hotels, Tavira Apartments, Accommodation ..
albufeira.a-portugal.c.. A - PORTUGAL.com - Albufeira Hotels, Albufeira Apartments ..
funchal.a-portugal.com A - PORTUGAL.com - Funchal Hotels, Funchal Apartments .. The estimated 117 daily visitors, each view 2.20 pages on average. The programming language environment is Nette Framework. Its 2 nameservers are ns2.ignum.cz, and ns.iinfo.cz. It is hosted by Internet Info S.r.o. Praha, using Apache/2 web server. Website load time is 1695 milliseconds, slower than 61% of other measured websites. As well, a ping to the server is timed at 123 ms.